Some players claim that one should bet on 'sleeping' numbers in the first place. These are the numbers that have not come out for quite some time. According to the probability theory, if black numbers have been hit for several times in a row, one should bet on red. Of course, the chances of red coming out are just the same as for black, especially as the history of previous spins of the wheel means nothing in the game of roulette. Nevertheless, some players still tempt their fate sticking to this theory. 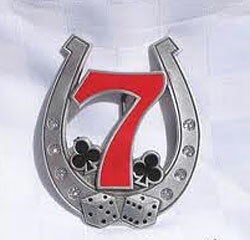 Other players tend to bet on any numbers that they consider lucky. These may be dates or numbers important for the player, like his or her date of birth or a certain number like 13 or 7, or simply a number that has once been winning for this particular player. Of course, all numbers have equal chances to come out with the spin of the wheel, but betting on one's lucky numbers may bring additional suspense to the game. There is also a belief that one should bet on the very color that is the first to catch his or her attention. In fact, there is a 50% chance that particular color will come out, which makes this superstition quite useless. A lot of players place their hopes on certain items that are supposed to be lucky. These may be horseshoes, rabbit feet, all sorts of lucky charms, particular items of clothing lucky for the player, etc. One may also cross his or her fingers, put chips on the layout in neat stacks or simply dress up for the game. There is a whole set of items and situations that are considered by most players unlucky. These may be unlucky color (like black) or number (like 13). Most players avoid going to the casino if a black cat crosses their path, if they break a mirror or walk under a ladder. It is also considered unlucky to use the main entrance of the casino. One of universal superstitions is saying prayers before the roulette game. The player may also carry some religious items like a rosary or a cross, or even carry out some rituals before the game. In general, superstitions may be the factors that increase suspense during the game of roulette, especially as it is impossible to change human nature which is eager to stick to the irrational. A lucky person may attribute his or her winning to mere luck. It is possible that such player will be more concentrated in the following game process than someone who starts playing ready for losing. Anyway, if the player follows more serious tips like making outside bets or preferring European roulette to American, he or she may get better chances to win in the game of roulette.